.380ACP: Little cartridge, big price? 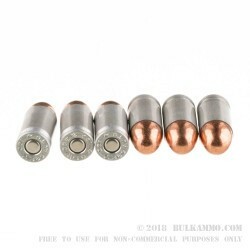 CCI solves this common complaint with its Blazer aluminum-cased ammo. Made to the same quality standards as CCI’s other renowned products, this .380 ACP cartridge fires a 95-grain bullet at 945 feet per second. Although it uses Berdan primers, this ammo is non-corrosive and safe to use in any firearm chambered for .380 ACP. The aluminum cases used in Blazer ammo cannot be reloaded, but they will feed and extract just as well as brass casings. Each box holds 50 rounds. 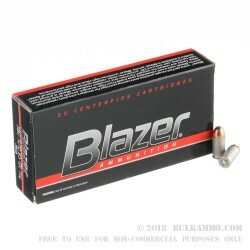 CCI produces some of the best value-priced ammo in the industry with its aluminum-cased Blazer and brass-cased Blazer Brass range cartridges, available in most popular calibers. Headquartered in Lewiston, Idaho, the company is also known for its extremely popular rimfire plinking and varmint rounds and its high quality primers. Since Illinois FINALLY passed a Concealed Carry Law, I bought my Wife a S&W M&P Bodyguard. Since .380 ammo is so hard to come by around here I finally found "Bulk Ammo" who had plenty in stock. 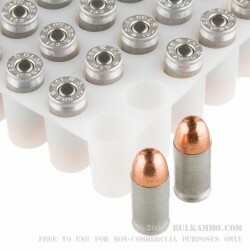 Since IL is still pretty much a "crappy" state for their "gun/ammo laws" I contacted "Bulk Ammo" on how to ship it to IL. All my questions were answered VERY quickly and after scanning and sending my info to them I received my 1st order in less than 5 days (which took a bit longer due to having to send my info to them for the IL laws before they could send it to me), and my 2nd order within 3 days. The ammo worked GREAT! Out of 400 rounds, I only had one FTF...but with the "second strike" capability of the Bodyguard, it actually fired when I pulled the trigger the second time. So I actually had NO failures! As far as the price... when you add the shipping, it is a bit more expensive than If I bought it locally. However....when you can't find the ammo you want locally, it's definately worth the extra cost!!! 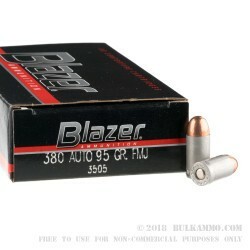 Q: Is Blazer Ammo made in the USA? A: Hello Wayne! Thank you for reaching out to us about this ammunition. Blazer ammunition is manufactured in the United States!